Tripod mounted speed signs; designed for speed watch applications. Ultra portable sid display systems. 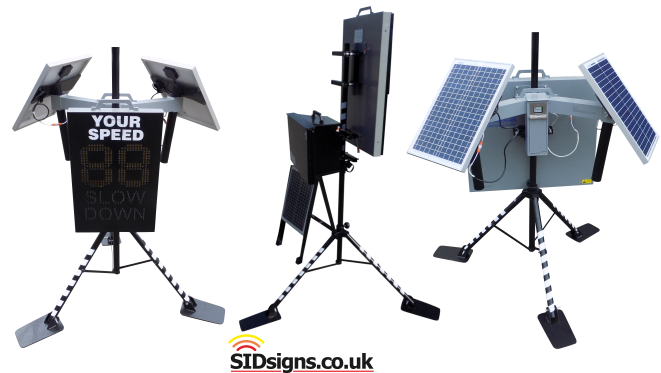 Finding tripod mounted speed sign systems can be difficult, sid displays are either designed to be permanently fixed to posts or suppliers don't have the ability to design & make a tripod system so just don't bother offering this as an option. Luckily for you there is a tried and tested tripod system which is specifically designed to work with our new portable speed sign format. As usual this device is manufactured from aluminium, the lightweight metal which is so obviously the best option, so often the one material not used for sid display production. Attaching a portable speed sign to a stable tripod base doesn't have to be difficult, it doesn't require expensive over engineering. The whole idea of the tripod system is to keep it simple, keep it affordable. A simple, lightweight, Black powder coated aluminium tripod fitted with specially designed stablising feet. That's about all there is to it. The most important part of this sign tripod are the feet. Manufactured from welded aluminium plate these feet pivot independently allowing for take up on uneven ground. Applied to the underside are thick rubber pads which reduce slipage and give a certain amount of grip even on smooth surfaces. Perhaps the most important part of the tripod feet are the way they've been designed to allow you to counter weight your speed sign. Wind loading is the enemy here, the last thing you want is for a gust of wind to blow everything over. Tested in high winds with plastic drums filled with water we've found that speed sign tripods fitted with these feet allow the whole structure to remain stable and secure. A simple approach to speed sign tripod design extends to how the sign is attached to the tripod assembly. You could mess around with special clamps or brackets but perhaps the simplest approach is better? The new universal clamping bracket used on portable format sid displays was specifically designed to allow use with these tripods; just clamp your bracket to the head of the tripod and your sign and it's power source simply lift on and drop off. Because it's the same bracket it can be used on anything; a fixed post, a tripod. This means you can retrofit a new tripod to an existing speed sign or take your tripod mounted sid display and use it on a fixed sign post. Used by community speed watch organisations along with the likes of the British Army, R.A.F. and private companies. If you want a speed sign that sits happily on a tripod this is a tried and tested solution, a solution which costs a lot less than you'd think.